Massive deforestation has been argued to be a major contributing factor towards the collapse of the Roman Empire. The Baths of Caracalla (the second largest bath complex of Rome) facilitated around 8,000 people per day and consumed around 1 tonne of wood per day which accounts for around 125kg of wood required per person per day. The setting of the video is believed to be a wood store in the underground complex of The Baths of Caracalla. Writing in the book Life Without Oil: Why We Must Shift to a New Energy Future, environmental scientists Steve Hallett and John Wright argue that as trees and forests became increasingly scarce in the region of Rome during the late Empire due to overconsumption, wood had to be hauled from ever further away. The law of diminishing returns undermined the economic performance of Roman industry, leaving Rome vulnerable to the other, well documented problems of invasion and internal division. The Roman Empire reached a tipping point of ‘peak wood’. In the subterranean setting of Peak Wood, the ancient and now heavily protected site has been flooded following a violent storm. Two grounds keepers have been given the task to drain the water, and clear the mud and sediment which had washed down into the space. The video finds them working through this site – a quiet contemplative space nowadays occupied by small numbers of reverential tourists — where once huge amounts of energy were spent bringing wood into the main stores of Caracalla. 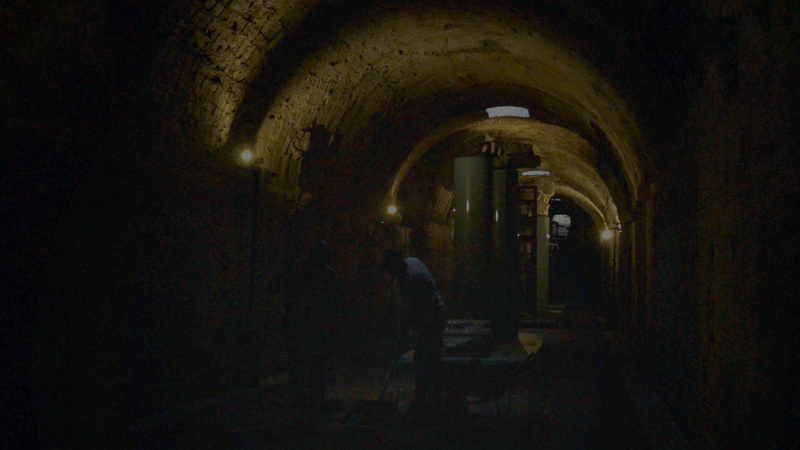 In near total darkness, the workers discuss AS Roma’s tactical approach in the recent football, and the method for cleaning up the dirt from this ancient historical site, whilst reactivating the vibrant energies preserved within the ancient walls and floors, with buckets, shovels and wheelbarrows.